TORONTO - The 13-year Major Component Replacement (MCR) project being undertaken as part of Bruce Power's life-extension programme will inject billions of dollars into Ontario's economy, a new report has found. Meanwhile, the major project to refurbish Darlington unit 2 remains on track for completion in 2020, Ontario Power Generation (OPG) has announced. The Ontario Chamber of Commerce (OCC) said its report, Major Component Replacement Project Economic Impact Analysis, outlines an impartial assessment of the MCR programme. The report was commissioned by Bruce Power. "Our analysis shows that Bruce Power's MCR project is a fundamental contributor to the Ontario economy. More broadly, the life-extension of the Bruce Power facility will provide quality jobs for Ontarians, produce a stable supply of medical isotopes for the world's healthcare system, and deliver economic benefit through direct and indirect spending," OCC President and CEO Rocco Rossi said. "As Ontario's energy demand grows, nuclear truly is the best option to meet those demands with reduced GHG [greenhouse gas] emissions. The Bruce Power MCR Project will not only drive economic growth in the region, it will position Ontario as a global leader in nuclear innovation and expertise." According to the OCC's economic analysis, the MCR's economic impact on Ontario is estimated to be between CAD7.6 billion (USD5.6 billion) and CAD10.6 billion. Nationally, its economic impact is estimated to be between CAD8.1 billion and CAD11.6 billion. It estimates that the federal government will receive CAD144 million in excise tax and CAD1.2 billion in income tax, while the provincial government will receive CAD300 million and CAD437 million. Ontario’s municipal governments are estimated to receive a collective CAD192 million in tax. The nuclear industry currently provides 60% of Ontario’s daily energy supply needs and is made up of over 200 companies and more than 60,000 jobs across a diversity of sectors such as operations, manufacturing, skilled trades, healthcare, and research and innovation, the report notes. Greg Rickford, Ontario's minister of Energy, Northern Development and Mines, and minister of Indigenous Affairs, said continued use of the Bruce generating station would create jobs and advance Ontario’s nuclear industrial sector. "It is great to see projects like the MCR that help make Ontario the best place to invest, do business and find a job," he said. The MCR is part of Bruce Power's overall life-extension programme, which started in January 2016. Bruce 6 will be the first of the six Candu units to undergo an MCR which will take 46 months to complete and give the unit a further 30-35 years of operational life. The total cost of refurbishing Bruce units 3-8 is estimated at about CAD8 billion, in addition to CAD5 billion on other activities under the life-extension programme, which is scheduled for completion by 2053. OPG's long-term refurbishment programme at Darlington began with unit 2 in 2016 after years of detailed planning and preparation. Reassembly of the reactor, which was disassembled last year, is scheduled for completion this spring, and the unit 2 refurbishment project remains on track for completion in early 2020. At the same time, final preparations are under way for the start of the refurbishment of unit 3. "We've entered a critical phase on the project," Senior Vice President of Nuclear Refurbishment Mike Allen said. "OPG and our project partners continue to work as an integrated team to meet our commitments on Unit 2 and our other three reactors at Darlington Nuclear Generating Station." 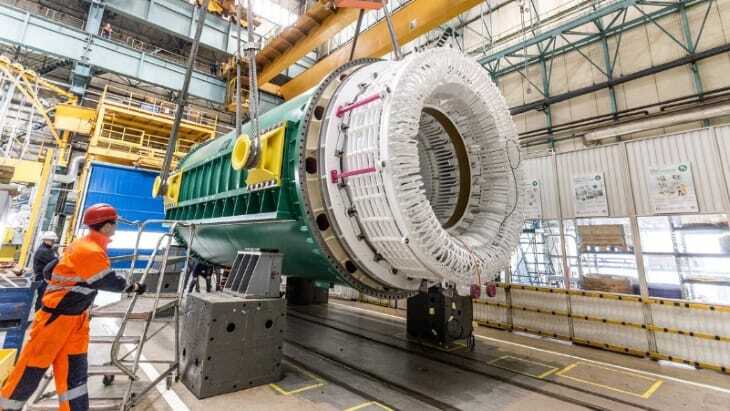 A 350-tonne generator stator manufactured by GE in Poland is currently in transit to Canada, where it will be installed in Darlington 3's turbine hall. The 10-year Darlington refurbishment is due to be completed in 2026.